This school year I have had the amazing opportunity to teach an applied mathematics course where we have used mathematics concepts to create art. This post is about a project that I made for the students to learn the process of using proportional reasoning to create a large scale paper mache object. I didn't have a Teddy Bear while growing up, I had a stuffed penguin. I slept with that penguin forever. Eventually it acted as a pillow that I would use to prop up my shoulder. As an adult now I still.... no, I don't sleep with a stuffed penguin, but I do sleep with a small pillow that does what my penguin used to. Funny. Anywho..... suffice to say, I've got an affinity for penguins! 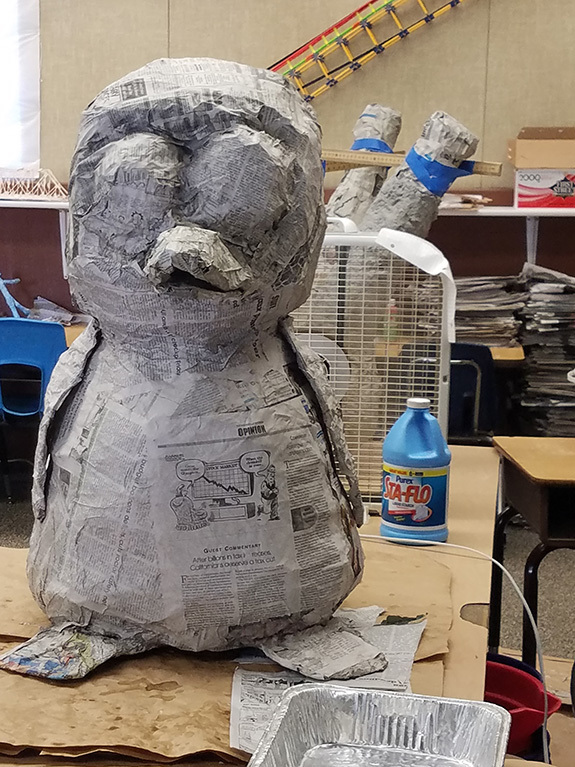 Thus when I set out to create a larger than usual paper mache object, of course I chose a penguin. I've done several paper mache projects over the years, however this is by far the largest of them. I think that it ended up being about three to four feet tall. The process is fairly simple. Step 1 - create a frame from chicken wire. Theoretically you could use just about anything for your inner form, but chicken wire is easily shaped. A downfall however is that it is easily bent out of shape. This was a fact I would have liked to have known later in the process. So, I would suggest if you do use chicken wire, it might be best if you support it from within somehow. Step 2 - once you have an inner structure in the vague shape of what you are trying to create, then begins the actual paper mache. I used simple liquid starch and newspaper. Cut up strips of newspaper, place it into a bowl of starch, and apply it to the form. With the first layer I like to kind of work it into the chicken wire. That kind of helps the paper to stick to the chicken wire. The first layer is kind of tricky, so I would suggest to do a single layer and let it dry. After the first layer is good and dry, generally at least 24 hours later, then go with more layers. If you plan on doing step 3, I would suggest you use many layers of newspaper. An estimate for this project is about thirty to forty layers applied fairly evenly over the entire structure. 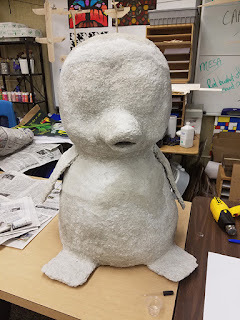 Step 3 - cover the entire object using paper mache clay. The are many recipes online for super nice recipes. 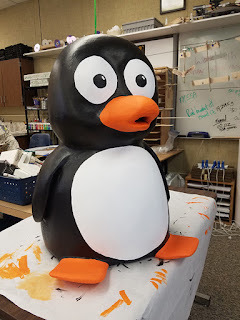 However being as this was a school project, I needed something inexpensive, and easy for students to do. Thus my process if pretty simple. Soak newspaper in water for 24 hours. Blend the newspaper into pulp. Strain most of the water from the paper, squeezing it from the paper. Hand knead in salt and flour. If you add more flour and less water, it will be more like a stiff bread dough, or even like a thick clay. If you add more water to the mix it will be more like a thick chunky pudding. So, how much of each? Hmmm..... I never measured it! Each batch ended up being about the same amount as a batch of cookies does. Does that help? No? How about four to six cups or so of drained paper pulp, one to two cups of flour, and about a half cup of salt. Or thereabouts. Seriously, this is me just guessing at the amounts. Once you have your clay, then spread it onto your object. This part is where it gets a bit tricky. The clay is super heavy. It will easily bend unsupported chicken wire. So a good inner form is kind of important. You could also do lots of layers of the starch and newspaper and then apply the clay in only small sections. The wetter your clay is the more important having an inner support structure is important. I found it best to do a very thick clay with as little water as I could get away with. This made it tough to spread on, but it didn't affect my inner structure as much. During this stage, of spreading on clay, you want to focus on creating the features you want to be visible in the final stages. My mixture set almost like a mix between plaster and cement. It is pretty tough stuff. And it made my project more and more heavy. I did use lots of layers. The initial paper covered form was not nearly as round as I wanted it. Thus I built up much of the roundness with the clay. 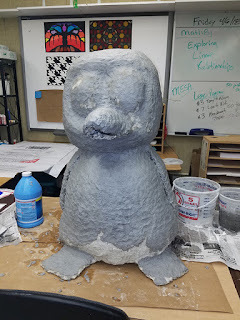 When you have reached the final layer of clay that you want to do, then focus on texture. I applied the clay, smoothed it into place, wet my hands and ran them over the wet clay. That helped to smooth things out. Step 4 - wow, step 3 was long huh? I used home construction quick dry plaster and covered the penguin entirely in plaster. 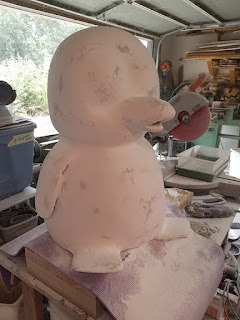 Step 5 - I sanded the penguin with several different power sanding tools. Step 6 - I painted my object using a white primer paint. This worked pretty well, however in some areas the paint cracked. Thus I filled in those areas with a super light mix of the quick dry plaster. I painted it on with a sponger brush and lightly sanded those spots. Step 7 - I used acrylic paints to apply the final colors. After that, I have just enjoyed my big new pal! I think he is absolutely adorable! Most of my students have agreed as well. 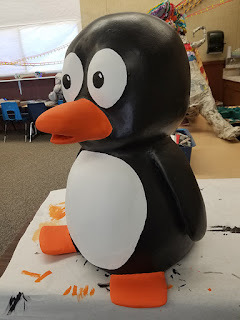 I think he will become my new classroom mascot! I can have that, can't I? 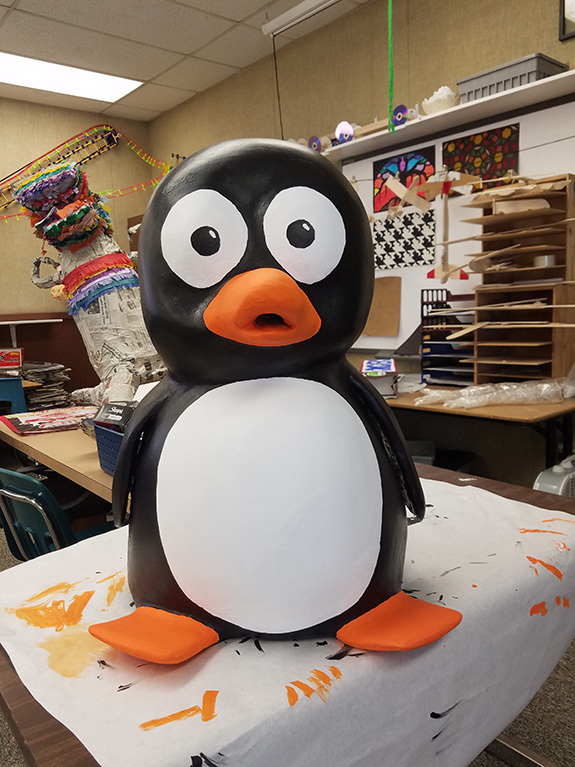 My school has a mascot, so why can't I have a classroom mascot? Pretty sure I can. I'm going to go for it. Okay. That's it. Thanks for being here! Did She Just Say Transing?